Picture one of those typical doctor intake forms. Would you check a box beside any of these? If you answered yes to any of the above, you likely have blepharitis. Blepharitis simply translates as inflammation of the eyelid skin, but it's commonly associated with conditions like ocular rosacea and dry eye syndrome. And it's extremely common - studies suggest as many 47% of all patients that are seen by an eye doctor have some degree of blepharitis. For decades the go-to treatment recommendation for chronic blepharitis was eyelid hygiene with baby shampoo. The concept? The most common causes for blepharitis are skin bacteria like Staphylococcus epidermis and Staphylococcus aureus or eyelid mites Demodex brevis and Demodex folliculorum. These strains of bacteria are found naturally on human skin, and Demodex mites are also extremely common: studies confirm 70% of 18 year olds have Demodex mites living on their facial skin and over 84% of healthy adults over 60 have mites. Both skin bacteria and Demodex colonies thrive when there are more dry skin flakes and skin oils hanging around the eyelid surface, growing rapidly and often causing chronic irritation as their populations explode. It's a dangerous feedback circle: the more the body inflames in response to bacterial growth or Demodex infestation, the more it sheds the surface layers of skin, giving bacteria and mites more of what they love to live on. Getting rid of dry skin and abundant skin oils is essential to minimizing the habitat for bacteria or Demodex, so doctors historically turned to baby shampoo as a "no tears" way to clean the sensitive eyelid area. The issue with baby shampoo is that the detergents and preservatives found within can actually promote skin irritation. Preservatives in baby shampoo like quaternium-15 chemically release formaldehyde, a known skin and eye irritant. Some research suggests that baby shampoo can interact with the eyelid's natural oil expression (meibum), turning it into a pro-inflammatory soap-like expression that is irritating to the eye and eyelid, a process called saponification. OCuSOFT lid cleansing products have the cleansing power to knock out skin bacteria and Demodex colonies, but are far more gentle and less irritating to the delicate eyelid skin than baby shampoo. 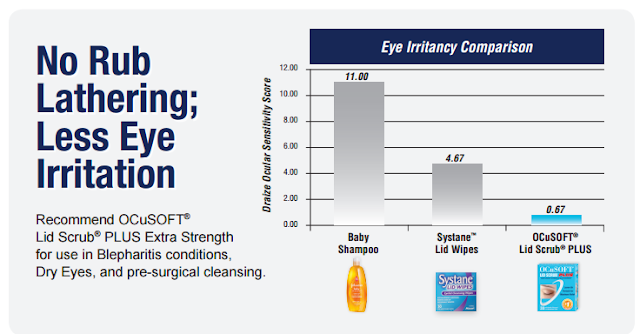 Studies assessing ocular irritation on OCuSOFT products found that OCuSOFT Lid Scrub Plus was "practically non-irritating" to the ocular surface if not rinsed off in 1 hour based on Draize score data. Baby shampoo was rated category 3 or "mild irritation" on LVET (low volume eye test) Draize testing. OCuSOFT products are graded as 16 x milder than baby shampoo for eye irritation! 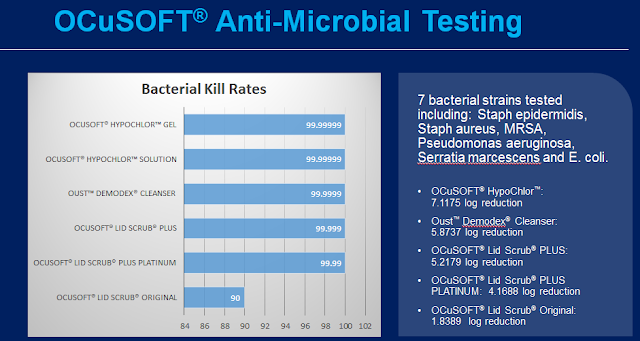 Not only were OCuSOFT products found to be more comfortable to the eye than baby shampoo, they also have significantly better bacterial kill rates. Studies on skin wound cleansing scored Johnson and Johnson Baby Shampoo as non-antibacterial at 24 hours against Staph. aureus at "cell-safe" levels, and additionally scored it with a high cytotoxicity index score (meaning it was considered highly irritating and damaging to healthy cells as well). OCuSOFT Plus lid scrubs have exceptional kill rates against common skin bacteria that are known causes of blepharitis, including Staph. epidermis, Staph. aureus, and even MRSA. Our recommendation? For chronic blepharitis put down the baby shampoo and reach for a specific eyelid hygiene product. 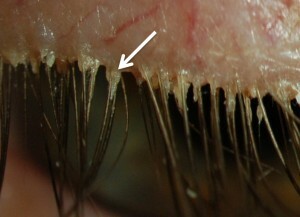 In my personal practice I recommend daily use of OCuSOFT Lid Scrub Plus for bacterial-based blepharitis until the eyelid inflammation is controlled, and then recommend use of daily lid cleansing products like OCuSOFT Original pads or foam longterm to help promote a skin environment that would be inhospitable to bacteria or Demodex infestation. Eyelid hygiene is part of my patients' everyday routine for clear vision and healthy eyes; you can't take a night off from caring for your eyes and delicate eyelid skin and expect your eyes to perform at their best level. OCuSOFT is gentle enough to be used as a daily cleanser for even sensitive skin types, and its strong enough to neutralize skin bacteria and help prevent chronic conditions like blepharitis and recurrent styes. OCuSOFT is a platinum sponsor for Eyedolatry but all opinions are my own. I started getting styes after the birth of my second child. That was 2.5 years ago. I get styes very frequently. Multiple times a week. I use moist warm wash cloths every night for ten minites. Wash my face morning and night with face soap that has a couple drops of tea tree oil mixed in. I am hygienic. I don't wear makeup. Any suggestions? The unique components involved in skin chemistry makes it hard to make a universal suggestion, but tea tree oil is a great thing you are doing! If your skin is prone to dryness, you may want to skip any preserved soap around the eye and use only nonpreserved oil cleansers. Oral medications like Doxycycline might be a great option for you, or IPL - a pulsed light skin and eyelid treatment with great benefit for patients with rosacea that are more stye prone. I'd recommend seeking out a doctor that specializes in dry eye because they will be familiar with meibomian gland issues and more aggressive with treatment options. This is quite an interesting review. I wish I could get some help and relief with recurrent styes. I suddenly started getting these a year ago, and there is one on each eye that never healed fully and both continue to pop back up every now and then in the same spots, and then they go away completely, and the cycle continues. I have been to several eye doctors that have said it's nothing to worry about, but it's so uncomfortable and makes me so nervous about what is going on in my body. I do have allergies, rosacea, and very sensitive blue eyes. I would love to get these cleared up once and for all, and keep them under control in the future, but I just don't know what else to do at this point. I was told to use baby shampoo to cleanse the eyelids, so I use it morning and night faithfully because they said I have a thicker type of oil on my eyes, but I don't know if doing it twice a day is maybe too much. Any suggestions you can give me would be greatly appreciated. Thank you. You should schedule an appointment with a dry eye specialist. With rosacea, you may be a great candidate for IPL treatment to reduce the risk of recurrent styes. Do occusoft products have any significant side effects? Ocusoft products are clinically tested, but they do contain preservatives - always check with your doctor first to see if a product is right for your specific skin chemistry!